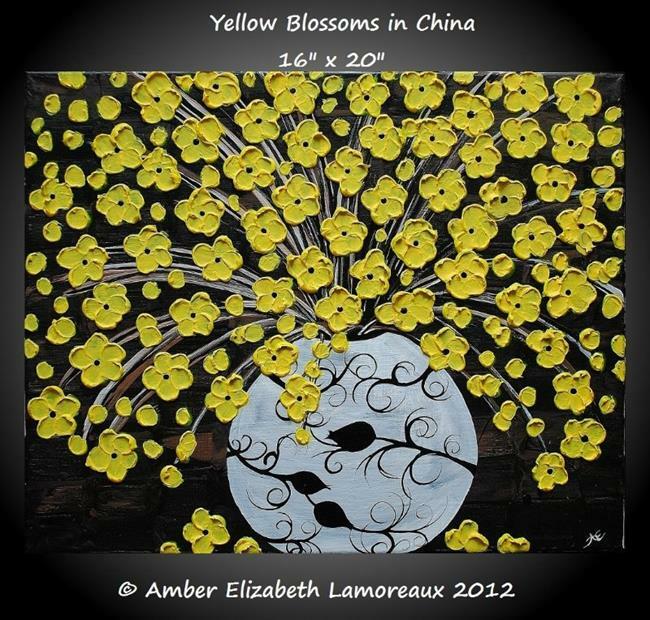 'Yellow Blossoms in China' 16" x 20" original impasto palette knife acrylic on gallery wrapped canvas surreal painting by Amber Elizabeth Lamoreaux. This is a heavy texture painting of surreal yellow blossoms in a white and black China vase. Beautiful contrasting colors and this painting has a great 3-d effect of the petals coming off the canvas that makes you want to touch the flowers. Yellow flowers are symbols of friendship, new beginnings, and happiness.